While UNESCO is contemplating to enlist the Golden Temple as the World Heritage Site (WHS) by next year, surprisingly Giani Joginder Singh Vedanti, Bibi Jagir Kaur, Mr Sukhdev Singh Bhaur, Jathedar, Akal Takht, and president and general secretary of the SGPC, respectively, have confessed that they have not read the dossier yet. The diametrically opposite views of the Sikh leadership on the issue have not only generated a lot of dust and heat, but also forced UNESCO to seek clarifications from the SGPC. Bibi Kiranjot Kaur, SGPC Executive member and coordinator of the dossier, alleges that the UK-based Dr Jasdev Singh Rai, an International Advisor to Jathedar Akal Takht, was pursuing some "hidden agenda" by spreading "disinformation" about the implication of the proposed Heritage Status of the Golden Temple. “In consistency with UNESCO's own guidelines and its subsequent letter, my concerns are that the Sikh community has not been consulted widely enough nor have the benefits and the implication of the heritage status to Sri Harimandir Sahib been put across to Sikh masses," alleges Dr Jasdev Singh Rai. Khes and durries perking up economy? Sounds rather strange. But it’s true in Kakka Kandiala village in the border belt of Amritsar. Those in the traditional business of Khes and durries are revamping their handloom units to meet the growing demand for these products. And the village economy is getting a good “boost up” in the process, we are told. Amritsar has often attracted attention for being the coldest place in the plains. The reasons for this are related to both geography and location. According to the meteorological observatory at the Amritsar International Airport, Rajasansi, which monitors the daily temperature and weather conditions, though there are no scientific explanations for the city being the coldest in the winter, the city’s location at the foothills of the Himalayas does make the difference. Come festive time and encroachments in the city increase manifold. While the Lawrence Road and other commercial routes have become chock-a-block with shop extensions displaying Divali items and gifts, pushcarts selling wares are also taking up space in commercials hubs of the city. — the only school for the blind here. The school was started in 1923. The school provides not only free education but also boarding and lodging for students coming from Himachal Pardesh, Jammu and Kashmir, apart from Punjab. “Kiing”— a folk music instrument and “gaddi” have re-emerged after decades in urban pockets here these days. Made of simple small earthen bowl covered with brown paper attached to bamboo, the “kiing” is attracting buyers. While UNESCO is contemplating to enlist the Golden Temple as the World Heritage Site (WHS) by next year, surprisingly Giani Joginder Singh Vedanti, Bibi Jagir Kaur, Mr Sukhdev Singh Bhaur, Jathedar, Akal Takht, and president and general secretary of the SGPC, respectively, have confessed that they have not read the dossier yet. The diametrically opposite views of the Sikh leadership on the issue have not only generated a lot of dust and heat, but also forced UNESCO to seek clarifications from the SGPC. "The Director General of UNESCO and I have been contacted during the recent months by several religious groups of the Sikh faith, based not only in India but also in the UK and Canada. These groups are concerned about the possible impact of the World Heritage listing on the charter of this sacred site," writes Ms Bhaswati Mukherjee, Ambassador, Permanent Delegation of India to UNESCO, to all concerned. The SGPC, which has submitted the dossier to UNESCO through Central Government, too, has decided to seek clarification from UNESCO. The SGPC's query is whether the bestowing of the WHS would have any adverse implications. Consequently, the efforts to obtain the WHS for the Golden Temple may run into rough weather. Unfortunately, the controversy has arisen at a time when the nomination file, submitted to the World Heritage Centre (WHC) in February this year, is currently being technically evaluated by the ICOMOS, the Advisory Body to the WHC. The spirit of one-upmanship, visible among the Sikh leaders, who want to be at the helm of the affairs, has already done a colossal damage to the community in the past, say observers. Apprehensions raised by a section of the Sikh community are that the WHS would enhance the chances of interference by the Central Government or its security agencies in the management of the Golden Temple. 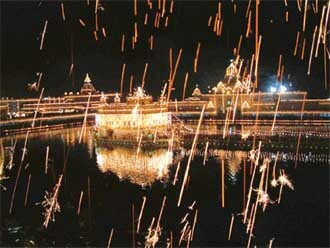 However, those who support the Heritage Status are of the view that such a declaration would rather minimise the chances of fortification of the Golden Temple by any militant organisation (as done during the days of militancy) and end the probability of Army operations like the infamous Operation Blue Star. A question that arises is whether the WHS would add any glory to the Golden Temple, especially when the BBC has already described it as the sixth most popular tourist site in the world. Most of the Sikh intellectuals, however, are unanimous about the view that the WHS would definitely attract more international tourists, apart from preserving the age-old heritage of the Sikhs. The Heritage Status would also stop the SGPC sponsored "Sikh Babas", who have destroyed invaluable heritage in the name of "Kar Seva", add the intellectuals. The dossier, of course, has many glaring discrepancies. The Sikh intellectuals like Dr Balwant Singh Dhillon, Head, Guru Nanak Studies, Guru Nanak Dev University, who were among those who had vetted the dossier dissociated themselves from certain additions that they described as "shocking". Dr Dhillon, who is a strong votary of the WHS for the Golden Temple, however, feigned ignorance over the inclusion of "unwarranted contents", which were probably added at the last moment. He alleged the final dossier was not shown to him, thereby putting the SGPC in a tight spot. The SGPC had to spend about Rs 20 lakh to get the dossier prepared by a private agency. The revelations made by Dr Dhillon have vindicated the stand of those who criticise the SGPC for keeping the dossier secret and not taking the Panth's consensus. A heritage expert, Prof Balvinder Singh of Guru Nanak Dev University, said that the WHS would help in preserving the precious art form like gach, morakashi, jaratkari that needed immediate attention. These days the art forms were under threat. The proposed status would give the Sikhs a worldwide recognition. The UK-based Dr Jasdev Singh Rai, an International Advisor to Jathedar Akal Takht, has opined that there should be a worldwide debate on the dossier, which has incorporated "highly objectionable points." Dr Rai, who apprehended the government's interference after the WHS, said that the concept of martyrdom, mentioned in the dossier, was not acceptable to the Sikh community. On martyrdom, the dossier reads, " It has been rightly pointed out that Sikhism incorporates ideas from Islam (such as idea of martyrdom) and Hinduism (such as name of Harimandir ) as much as it is critical of the ritualistic and discriminatory elements in both. For instance, it is critical of political Islam i.e. its association with state apparatus and of the caste system and idolatry in Hinduism." Expressing surprise over this, Dr Dhillon said he did not know who had incorporated this paragraph even after the vetting of the dossier. He said Sikhism itself had strong practice of martyrdom as practised by Gurus themselves, and there was no truth that the idea was borrowed from any religion. He, however, said that the WHS to Golden Temple would go a long way in preserving the heritage of the Sikhs. He dismissed the apprehensions that the WHS would enhance the chances of the Central Government or the police interference in the management of the Golden Temple. Instead, it would help in curbing the chances of army operations like the infamous Operation Blue Star. The heritage lovers the world over would oppose such operations in future. Bibi Kiranjot Kaur, SGPC Executive member and coordinator of the dossier, alleges that the UK-based Dr Jasdev Singh Rai, an International Advisor to Jathedar Akal Takht, was pursuing some "hidden agenda" by spreading "disinformation" about the implication of the proposed Heritage Status of the Golden Temple. She says that the SGPC would ask Jathedar Akal Takht to check the credentials of Dr Rai. She refutes the allegation that the dossier was kept as a "secret document". "Dr Rai himself had appreciated the dossier, obviously after reading it. The dossier was prepared and vetted by Sikh intellectuals of Guru Nanak Dev University, Panjabi University and internationally-acclaimed heritage experts, and Central Government had nothing to do with its drafting," she says. She adds, "Dr Rai has no moral ground to question the contents of the dossier, as he had challenged the veracity of the SGPC being a supreme body of the Sikhs." Bibi Kiranjot claims that the heritage status will not invite any interference by the Central Government. Bibi Kiranjot says that the SGPC won't let maryada be violated at any cost. "In case of any unwarranted interference, we would prefer the de-listing of the site," she says. “In consistency with UNESCO's own guidelines and its subsequent letter, my concerns are that the Sikh community has not been consulted widely enough nor have the benefits and the implication of the heritage status to Sri Harimandir Sahib been put across to Sikh masses," alleges Dr Jasdev Singh Rai , international advisor to Jathedar. "We cannot allow a few Sikhs to decide on important matters. The SGPC is a regional organisation and only a small part of the Panth, and is not THE PANTH by any stretch of the imagination. The dossier has important and misleading statements, such as - the SGPC is the highest religious body among the Sikhs and its decisions are considered final by all Sikhs. The SGPC cannot, under any circumstances, supercede Sri Akal Takht Sahib," Dr Rai adds. * The heritage status would increase public awareness about the site and impose primary responsibilities on the government to preserve the property and its original architecture as per the highest standards of preservation. * In case of any regional war, the parties in conflict will be obliged to refrain from attacking Sri Harmandir Sahib. * There would be a shared international commitment to preserve the heritage and legacy. * Any new construction will need to be notified. It will have to get the approval of the World Heritage Committee. * The SGPC will have to consult UNESCO while carrying out repair work. Apprehensions mainly concern issues of sovereignty, possible interference and restrictions in practices in the complex. According to the guidelines and questions in the nominations format: the state is required to take the appropriate legal, scientific, technical, administrative and financial measures necessary for the identification, protection, conservation, presentation and rehabilitation of this heritage. On this Dr Jasdev Singh Rai, says, "Will the state consider it legitimate to extend the role of its police force and security agencies in the internal security of Sri Harmandir Sahib?" 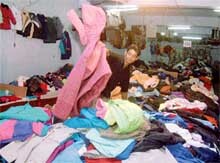 “The entire stock is sold without any problem. We manage to earn a reasonably good income,” says Mr Kirpal Singh, whose family has been into the business of khes and durries since the pre-partition days. 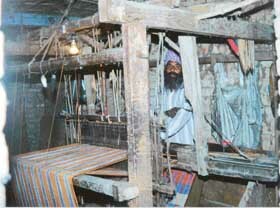 “My grandfather started his khes business with just two looms, which my father increased to over two hundred looms. I have replaced the old looms and bought 10 power looms to set up a modern khes and durri unit,” he explained. Interestingly, some of the manufacturers also do the work of designing. They also provide training to the new recruits. Marketing has not been a problem with them, as their entire produce is readily sold not only in the rural belt of Punjab but also in parts of Uttar Pradesh, Haryana and even Maharashtra. Most of the manufacturers are not too eager to explore the export-potential. Their contention is that they have a ready market here, so there is no need to export the products. However, some like Mr Kirpal Singh are not averse to take a shot at exports, if they get “attractive orders”. “Though I am not much interested in exporting durries and khes, if I get good orders, I may go in for it,” he says. Amritsar has often attracted attention for being the coldest place in the plains. The reasons for this are related to both geography and location. According to the meteorological observatory at the Amritsar International Airport, Rajasansi, which monitors the daily temperature and weather conditions, though there are no scientific explanations for the city being the coldest in the winter, the city’s location at the foothills of the Himalayas does make the difference. The Director, Airport, Mr V. S. Mulekar, who had been studying the phenomenon, especially during winter, says that huge air mass spread over hundred to one thousand square km moves towards low pressure area from the cold regions of Dhauladhar and Kashmir. It descends on this area bringing the temperature down. He adds that the phenomenon of excessive dew, especially during the months of September and October, also brings down the ground temperature at night. The second logical explanation given by geographical experts is that the city is situated between the two major rivers, the Ravi and the Beas, which flow into this region through the Himalayas, and bring with them cold and breezy water gushing from the heights. The river creates a funnel kind of a corridor phenomenon, which also brings in cold condition whenever there is a heavy snowfall in the hills at Shimla or Kashmir. Sometime, the temperature in the city falls below normal in comparison to Shimla and Srinagar during the months of December and January. This could be described as the cold winds with huge air mass flowing into this corridor created by the vicinity of the two major rivers. Come festive time and encroachments in the city increase manifold. While the Lawrence Road and other commercial routes have become chock-a-block with shop extensions displaying Divali items and gifts, pushcarts selling wares are also taking up space in commercials hubs of the city. With Municipal Corporation turning a blind eye in view of “festivities”, the problem assumes enormous proportions, as encroachments often end up as permanent structures, and political patronage helps encroachers to circumvent the law. A pointer towards this is the encroachment by an area councillor, Mr Surinder Chaudhary, who has made an extension of nearly 12-foot beyond his shop on Amritsar–Wagah international route. The matter assumes added significance, as the encroached road is the main highway to Wagah border and international railway station at Attari, besides being a route to the ancient Ram Tirath Temple. Taking a cue from the councillor, the neighbouring shops, too, have followed the example and encroached the route. Makeshift-racks display clothes outside the councillor’s shop taking over most of the area meant for footpath on the main GT Road. Interestingly, Chaudhary’s name as the area councillor figures on the stone placed at the GT Road divider opposite his shop and at Putlighar crossing. Mr Chaudhary, when contacted, said he would get the encroachments removed very soon. He promised “not to encroach the route again”. Meanwhile, the entire ward is full of encroachments. Almost three-fourths of the connecting streets here are encroached. Nearly 60-foot wide roads here have been encroached by pushcarts, shop extensions and illegal religious structures. Frequent accidents and brawls break out due to traffic jams in the largely commercial and industrial area. So much so that the main Putlighar crossing on the GT Road is encroached on all four routes, causing frequent traffic jams. 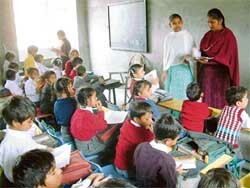 Thirteen-year-old Deepak, a student of VI class, is visually challenged. But he has a dream — he wants to be a teacher. He is not the only one with a dream. Like him, there are many others who have similar ambitions. These are the students of Andh Vidyalaya— the only school for the blind here. The school was started in 1923. The school provides not only free education but also boarding and lodging for students coming from Himachal Pardesh, Jammu and Kashmir, apart from Punjab. Presently, the school has 72 students from various parts of the country. They are being taught academic curriculum and also motivated not to let their disability cow them down. The institute inspires them to become self-sustaining, useful citizens and to emerge winners in their chosen fields. “We are helping children to become confident and independent. They are being provided a supportive environment here. Many people believe that the visually challenged lack the ability to excel in academics, but these students have proved them wrong,” says Mr Manjit Singh, Principal, who is visually challenged himself. He is an alumnus of the same institute. The students start their studies with the learning of “Braille” (embossed letters and forms). By the time they reach higher classes, they are able to study all subjects recommended by the Punjab School Education Board. The institute also facilitates vocational training for students by helping them learn crafts and by training them in the art of weaving. Amarjit Singh, 15-year-old student of V class, is an expert at weaving. He wants to make it his profession in future. Music is compulsory in the institution and it has a special arrangement for the study of music, wherein students can learn vocal as well as instrumental music, including flute, tabla and harmonium. “My favorite singer is Sardool Sikander and I want to be a Punjabi singer,” says Gurdas Singh, V class student, taking time off from a demonstration of beautiful recital on the flute. The school has been providing a ray of hope to the students, who may otherwise not have found their life’s calling. Rahul Kumar, a student of III class, lost his eyesight in an accident. He was devastated. But the school helped him overcome his dejection. Today, he’s doing brilliantly in studies. Amazingly cricket is a hot favorite among these students, who enjoy playing it in evenings. Chess, too, has many enthusiasts among the students. Rinku Malik says he loves cricket and is a good player. He makes no less than 50 runs for his team every time and keeps regularly in touch with the latest through commentaries. “I want to play for my country like Sachin Tendulkar”. Perhaps, he may participate in the world Olympics for the handicapped one day! The school boasts of a library of about 5000 books, including novels, storybooks and books on general knowledge that are in “Brail”, informs Ms Sheetal, Assistant Librarian at the school. A Students’ association looks after students’ services, rights and welfare. The maxim: “Ideas rule the world, thoughts rule our life. It’s our mind, which moulds our destiny.” guides the students here. It’s “Never ever give up” for them and it shows in their daily lives! “Kiing”— a folk music instrument and “gaddi” (a toy cart that was popular in the 1950s courtesy the hit film “Do aankhey baarah haath”) have re-emerged after decades in urban pockets here these days. Made of simple small earthen bowl covered with brown paper attached to bamboo, the “kiing” is attracting buyers. The melodious tune of “Ae maalik tere bandey hum” played on this instrument brings back nostalgia among residents, who flock around Subhash Sarangiwala, one of the “kiing” artists, who not only manufactures the instrument but also plays it with élan. These days, it has become almost a routine with him to play melodious hits for people fond of old songs. So caught up is he in his old songs that many a time he even refuses to play current chartbusters and loses customers in the process, he tells us. It’s the melas that have attracted artists like Subhash to the city. Many artists have rented shops at the Delhi Tourism and Transportation Development Corporation to sell rural folk items to fascinated foreigners. Almost 100 pieces, with their prices ranging from Rs 10 to Rs 50, are sold daily, they say. Many of their products provide instant diversion and amusement during the melas. Subash, who has played on Doordarshan, says the buyers are from Gurdaspur, Amritsar, Dhariwal, Pathankot.